Convenient towelette size 8" x 6"
GymWipes now provides EPA registered disinfectant wipes in a 700 count (extra-thick, super-absorbent 8" x 6" towelette size) designed to sanitize surfaces. Alcohol-free, bleach-free and phenol-free. Gym Wipes Antibacterial Towelettes, are pre-moistened, disposable, surface disinfecting wipes, that have been developed to stop cross-contamination on surfaces. 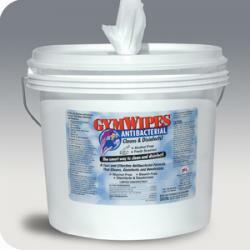 Gym Wipes will sanitize surfaces and kill 99.9% of germs that can cause illness. While working out, people often sweat, cough or sneeze, leaving behind germs that can spread the common cold, bacteria and many other types of illness. Gym Wipes Antibacterial Towelettes are an easy and hygienic way to lower the risk of infection and cross contamination. Gym Wipes Antibacterial Towelettes are proven to kill bacteria such as Salmonella choleraesuis, ATCC #10708, and E. coli, ATCC #11229. The formulation begins to eliminate germs on contact, and once it has fully evaporated, the germ-killing action is complete. Gym Wipes Antibacterial are perfect for controlling and eliminating organisms on high traffic surfaces that people come into contact with everyday.